We’ve made a lot of progress over the past few days! Since the last post, we moved the drill and rod modules a short distance to start a new borehole. Our thinking is that it is better to focus on augering new holes that we can work with, rather than spend time trying to salvage holes by bailing out a lot of cuttings. On the 27th we began augering hole #3 and successfully penetrated to 131 meters below the surface in only a few hours! This eclipses our earlier holes this year at 97 and 105 meters. As far as we know, these are depth records for mechanically augering boreholes in Antarctic firn and ice! 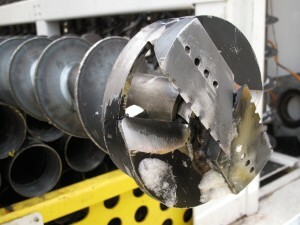 Business end of a firn auger. We made some major modifications to this tool in terms of cutting geometry and pass-throughs. Cuts very well! An empty auger rack is a good sign — it means augers down the hole! Eighty-five augers were used to get to 131 meters. We are very happy to have reached this point. We seem to have dialed in just the right combination of auger penetration rate and drill rotation speed to cut and clear the borehole. Now we have reached the depths we’ll need for drilling on the Polar Plateau, a major milestone in our progress toward deep drilling. For the future, we want to refine the chip removal process so that we can evacuate a higher proportion of cuttings from the borehole, but it’s a relief to know that we can successfully get in and out quickly enough to make a good, clean borehole without getting bound in. The next day we tripped in a long section of casing pipe with our inflatable packer. The drillers are especially glad to do this because they can run in pipe 30 feet at a time. Casing is threaded whereas augers have to be bolted together, and 30 foot sections are a lot faster to make up compared to 5 foot auger flights. Before lunch we had the packer assembled and down to about 300 feet. Making up a joint with HWT casing. 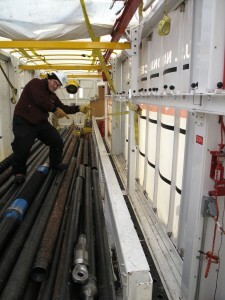 Hoisting a 30-foot section of packer casing up into position for tripping into the borehole. Think of a packer as a cylindrical rubber tube that can be inflated. It has a diameter just slightly less than the dimension of the borehole wall. Using air or inert gas, we inflate the packer against the ice far enough below the surface to create a pressure seal. After hooking up the packer feed line to a cylinder of pressured nitrogen gas used to inflate it, we put compressed air down the casing pipe and into the borehole space below the packer to check the seal. Success! 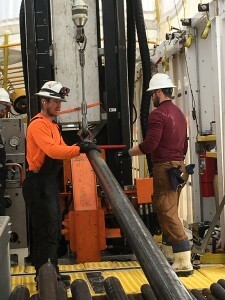 We were able to hold and maintain pressure below the packer on repeated attempts, which means that we will be able to confine the fluid used in drilling. This is a huge step forward for us. It’s what we had hoped to achieve last year, but getting to the depths needed in impermeable ice had eluded us. 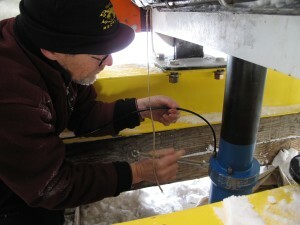 Now, with this step completed, we can move to our next major goal — drilling deep ice. 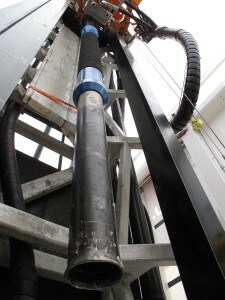 View from the bottom of the casing pipe up to the blue packer. The black sleeve in the middle is the inflatable rubber section. Jeff is hooking up the nitrogen gas line to inflate the packer. It’s cold underneath the drill rig! 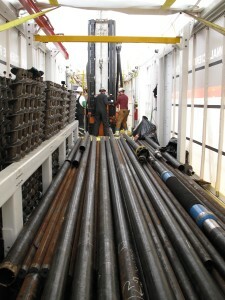 View from the rod rack to the drill mast. Each casing pipe is 30 feet long. 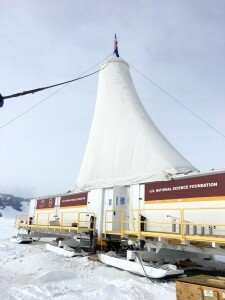 The next phase involves setting up for drilling in ice with fluid-assisted reverse-circulation. 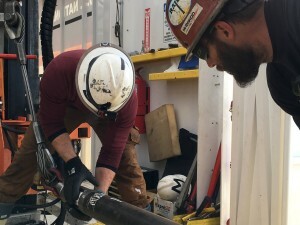 That requires connecting hoses to the fluid recirculation system, setting up the drill to work with smaller diameter pipe, adding the fittings needed to confine fluid and maintain borehole fluid pressure, and switching out cutting tools. A myriad things to do, but for the drillers this is their ‘bread and butter’. The process ahead is basically the same as used in drilling through rock for oil and gas exploration, or for taking core in mineral exploration — we just use a different fluid and we’re drilling through ice. They’re really in their comfort zone now. 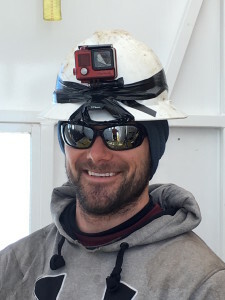 Driller Matt is a ‘happy chappy’ while tripping in casing. Wonder what’s on the GoPro. RAID drilling rig held secure with guy wires. The next few days will hopefully bring more good progress.